The Tech received copies of several letters addressed to James R. Tewhey, former associate dean for residence and campus activities. Tewhey confirmed that he received the letters. Provost Mark S. Wrighton and Personnel Director Joan F. Rice refused to comment on the letters or the events discussed in them. I have thought a great deal about what action to take concerning the grievance contained in your letter to me dated April 13, 1993 (and the earlier letter to which it refers dated March 3, 1993). While I know that this answer will disappoint you, I have concluded that there is not sufficient basis for MIT to go forward and process the grievance. I recognize that MIT's harassment policy, which you claim was violated by Katherine Nolan, reads broadly. It prohibits verbal or physical conduct which has the intent or effect of unreasonably interfering with an individual's work performance, or creating an intimidating, hostile, or offensive work environment on or off campus. Nonetheless, I do not believe that the policy was intended to apply to a dispute between two MIT employees where, as here, the interests represented by the policy are only peripherally implicated. Let me try to explain. As I understand, you and Ms. Nolan had a romantic relationship which ended sometime in July 1992. You had no supervisory authority over Ms. Nolan, and as far as I can tell the relationship was mutually consensual. Under those circumstances the relationship was none of MIT's business. When it broke up, and here I am accepting your characterization of what happened, Ms. Nolan engaged in conduct intended, in part as least, to cause MIT to ask you to resign. In fact, though, much of the conduct that you complain about had nothing to do with your work at MIT. You say that Ms. Nolan made telephone calls to your wife, mother, and neighbors, apparently made telephone calls to your home and hung up when the calls were answered, and attempted to obtain records about you from other institutions. While it is true that MIT's harassment policy is designed to protect employees even from off campus conduct (and it may also be true that Ms. Nolan either represented herself to people that she called as working with you at MIT or she made some of the calls from her office during working time), this behavior is still essentially one aspect of a private relationship, albeit its bitter aftermath, that MIT could not or would not have regulated in the first place. You also complain that Ms. Nolan went to your supervisor, her own supervisor, and to MIT's ombudsman, and said things that you regarded as untrue and potentially harmful to your position at MIT. To some extent, of course, anyone at MIT has a fair amount of latitude to complain to those in management about the allegedly offending behavior of others (in the same way that you complained to me in your March and April letters about Ms. Nolan's behavior). MIT would not attempt to inhibit such communications except in extraordinary circumstances. In any event, by your own account you effectively addressed the matters raised by Ms. Nolan when they were brought to your attention. For example, when Dean [for Undergraduate Education and Student Affairs Arthur C.] Smith told you about the substance of what Ms. Nolan had related to him, you responded that nothing she said was work related and it had no relationship to your job performance; indeed, you refused to discuss with him what you viewed as a personal matter. You were probably right to say this to Art Smith then; and it is also right for me to say this to you now. In a way, that is my point about your grievance as well. Finally, you complain of a pattern of Ms. Nolan's following you around the campus (and off campus as well), waiting for you in the parking lots, and otherwise deliberately creating opportunities to encounter you. While this may come the closest to engaging MIT's harassment policy, the problem I have with this part of your grievance is that it has already been addressed by the civil courts in the respective actions you and Ms. Nolan brought for restraining orders. It is neither realistic nor practical for MIT to undertake an investigation of these matters when they have already been addressed by judicial authorities. In sum, I do not believe that MlT's grievance procedure should be invoked to provide a forum for what is essentially a private dispute between two parties, with only tangential involvement of MIT's harassment policy. Jim, I can appreciate that these last couple of months have been extremely distressing for you and I regret any additional distress my response may cause. Please know that I am concerned for you and I am available to help where I can. I am going to defer taking any action on the issues you raised in your July 26, 1993 letter regarding Ms. Sharon Shea. raised in your letter is because I believe that the primary effort that should be made now is to resolve formally your severance arrangements with MIT. Joan Rice, in her July 9 letter to you, invited you to finalize arrangements that I had proposed back in April. As I understand it, you have not yet scheduled a meeting with her for this purpose, and I ask that you do so as soon as you can. It is my intention that such arrangements be concluded promptly. On April 21, 1993, the Provost Mark Wrighton wrote to you to confirm the verbal agreement you reached in a meeting held the prior afternoon concerning your resignation as associate dean and section head residence and campus activities. 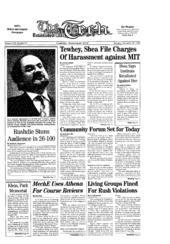 In accepting your resignation effective April 20, 1993, Professor Wrighton agreed that MIT would continue to pay your full salary and benefits through June 30, 1994. It was expected that you would sign and return the letter as your confirmation of the agreement. MIT has implemented its part of the agreement in good faith and has continued your salary and benefits without a break. Would you please sign and return a copy of this letter as confirmation that you have resigned and MIT will continue to uphold its agreement to pay your salary and continue benefits through June 30, 1994. If you are unwilling to confirm your resignation in writing you leave MIT little option but to assume that you are rejecting the agreement and to discontinue providing salary effective October 15, 1993. The following letter, from Tewhey to Wrighton, has been edited slightly. In Ms. Rice's letter to me of October 7, 1993, she writes, "MIT has implemented its part of the agreement in good faith. . ." This statement is totally without foundation. I would be the first to agree that in April/May of 1993, MIT and I came to an agreement. I believed I had secured from you a commitment to act on a grievance I had filed on April 13, 1993. In return, I agreed to resign. The terms of that agreement were confirmed in a meeting with Joan Rice in early May. During that meeting, she informed me that you had agreed to a wide ranging investigation of all of the allegations I had made and all those that had been made against me. In June, after Commencement, when students had left the campus, faculty had departed and the student newspapers closed, I received a letter from Ms. Rice informing me that MIT would not undertake the investigation she had described in May. I have spent the last five and a half months trying to get MIT to reconsider this decision and to act in good faith. My efforts have been in vain. In these last five an a half months, I have been attacked both on and off campus. E-mail of the most vicious kind has been sent out over a number of MIT networks describing me as the "main problem with harassment at MIT" as "a sexual predator" etc. I have provided MIT with copies of some of this correspondence and with the names of those who received it and the name of the individual who sent it. I filed a second grievance, based on this and other matters, and you have refused to act on it. This last week, my adviser at the Massachusetts School of Law, along with several faculty and staff members of the school, received packets of material that included current MIT publications. The information contained in those packets was inaccurate, inflammatory, and calculated to create a hostile environment. Clearly, this was intended to disrupt my ability to continue my education. In addition, I have come to believe that the Department of Social Services has been contacted and that I might be forced to confront an allegation that I have sexually abused my daughter. I want you to know that I hold you [five names blanked out] personally responsible for these continued acts of harassment against me and my family. All of you, with the exception of [one name blacked out] have a professional obligation to protect MIT employees from acts of harassment. As a group, you have not only failed to protect me for well over a year, but by your inaction, have encouraged the belief that my family and I are open targets to be attacked at will. You have sent a message that individuals at MIT will not be held responsible for their actions if they choose to attack me, even when those attacks originate in their offices, at their computers, and during working hours. While this in itself is a gross breech of your responsibilities, I believe, some of the above individuals have acted even more recklessly and irresponsibly. Joan Rice has admitted to me that some of the above individuals became "emotionally involved in this issue and have lost all, perspective." In addition, she stated that one of the above, "doesn't play it straight with people." It is my belief, and I think imminently provable, that several of the above encouraged the original attacks against me by Ms. Nolan and continue to encourage attacks against me and my family by what they have said and done and what they have not said and done. You know this to be true and have known it at least since April. This grossly negligent behavior on the part of some MIT officials has been, I believe, one of the factors in your refusal to carry out a wide ranging investigation. I have explored every avenue at MIT in an attempt to get you to do what you said you would do. My efforts have failed. I firmly believe your decisions have been short sighted and based on expediency and political considerations. I am convinced that your actions will, in the long run, hurt both men and women who work at the Institute. The message you have sent and continue to send is that harassment will not only be tolerated at MIT but, in some cases, encouraged. You and those who work for you have, in this matter, shown a callous disregard for the truth and an utter indifference to the well being of me and my family. Since my agreement to resign in April was tied to the commitment that MIT would undertake an investigation of my grievance and since you have refused to do so, I no longer feel bound by that agreement. I, therefore, will refuse to resign based on your assertion that ". . .the existence of a court order makes your position at MIT untenable." Given that the court order was issued based on perjury, exaggeration, and misrepresentation both by Ms. Nolan and Mr. Hudson; given that you and others at MIT know this to be true and given that I was asked to resign based on these allegations and only these allegations, I cannot do so in good faith. As I believe I have informed you earlier, I have asked Joan Rice to be the individual to deal with you and the issues you have raised concerning your experiences at MIT. I have forwarded your letter dated October 15, 1993 to her. I understand that she will be contacting you again shortly.